This is quite a physical game that requires some contact but is a lot of fun. Suitable for: older children and teens (8-18’s) although many adults enjoy this too! Safety First: this game involves people knocking into each other, so has a slight risk of injury (although we’ve never had a problem). 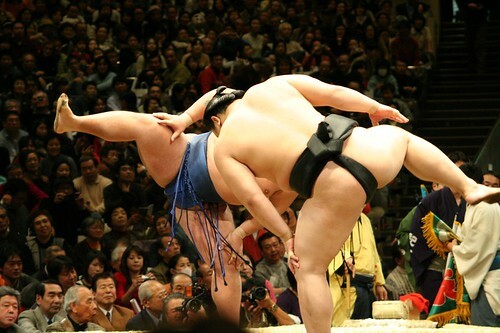 If you have particularly aggressive individuals, you might want to think about wearing padding or sumo-style suits. Get everyone to pair up with a partner and stand opposite each other a few feet apart while lining up with other pairs. You should end up with two lines of people facing off against each other with a big space between. This is your arena! Now number each pair from 1 upwards and ask them to remember it. When the game starts, the referee calls out a number and that pair steps forward into the arena – except that they have to keep hopping on one foot while keeping their arms folded! The idea is that by hopping around and knocking into each other, the opponents have to try and make the other put their second foot back on the floor. The person that remains hopping wins the battle and gains a point for their team before returning to the line. Then another pair has a go. The referee continues to call out numbers until each pair has had a turn. You can then repeat and allow everyone another chance or you start to call out 2 numbers at a time to create bigger battles and tag teams!